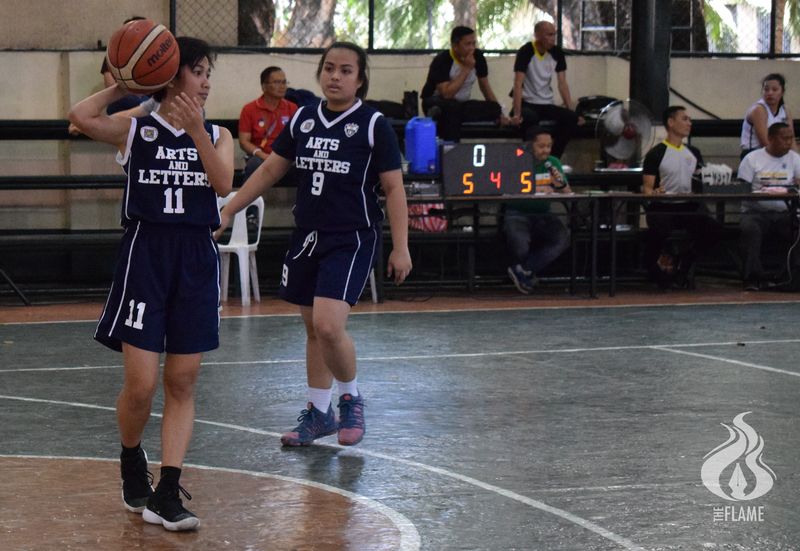 THE FACULTY of Arts and Letters’ (AB) Women’s Basketball Team on Friday suffered a crushing defeat in their semifinal game versus the Institute of Physical Education and Athletics (IPEA) anew, 26-64. IPEA started strong with an immediate nine-point run led by Romina Regine Manahan who sank multiple jump shots ahead of the paint. AB ended the first quarter with a run of their own to narrow the gap, 9-15. AB stepped up their defense in the second quarter, preventing IPEA from clinching a field goal until the six-minute mark. However, AB soon crumbled on the back of their sloppy ball handling and grip that allowed IPEA to bolster their lead, 16-29. Despite Marienne Renee Durano’s eight-point contribution past halftime, AB lost control of the game with IPEA successfully converting multiple steals and erratic turnovers into points, 12-47. Baby Love Barbon of IPEA ran through AB in the third quarter with her unstoppable fastbreaks. AB Head Coach Dan Kewell Din said his team will train doubly hard on Sunday to prepare for their fight for third place. “Mag-a-adjust kami. ‘Yung mga mistakes kanina, I hope mai-correct namin sa Monday para ‘di na maulit. ‘Yung turnovers na ‘yan na kinagalit ko kanina. Turnovers na nagbigay ng momentum sa kabila,” he told the Flame. Din said he will continue implementing his program of discipline and hard work to make it farther in future seasons. AB advanced to the semifinals of the Goodwill Games last Tuesday after slipping past the College of Tourism and Hospitality (CTHM), 49-47. Din was proud to say that AB Women’s has consistently reached the semifinals stage in the past four years, but added that the team has a history of losing to IPEA.